As a start-up, effectively managing your marketing budget can be a tiring task. In truth, it is all about being smart with your priorities when it comes to managing a marketing budget. Ask yourself: what do I want to achieve with my marketing budget? Are you looking to increase your company’s brand presence, or do you want your marketing to result in more website visits? You have to know what you want to achieve before you set and manage your marketing budget. You do this by setting KPIs (key performance indicators), which you will use to measure your success in reaching your goals (i.e. what you want to achieve) in the long run. For example, if you are looking to increase your monthly web visits, it is helpful to understand how many monthly visitors you are currently getting to your website, and then consider what percentage increase you expect to see from your digital marketing activity. 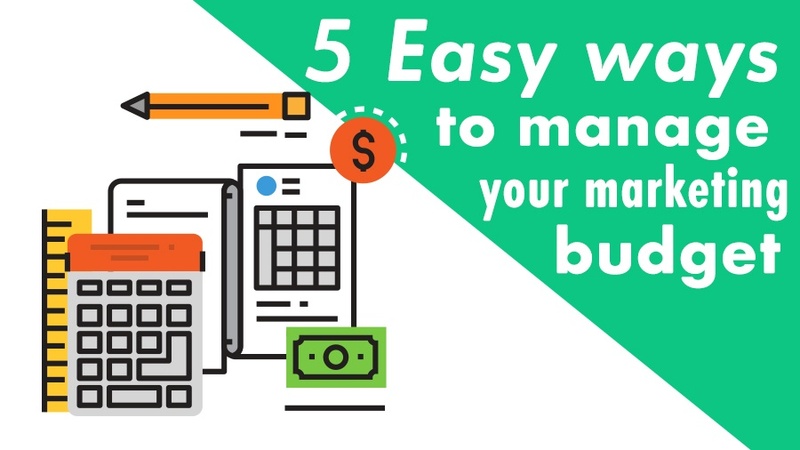 Here are 5 ways you can manage your marketing budget to work for you, so you can achieve your marketing goals and meet your KPIs. The first way to make sure you are effectively managing your marketing budget is to set a realistic budget. Ensure that your budget is affordable and easy to maintain over the period that you have defined. Your marketing budget can be split up monthly or per quarter, with an associated plan to reach your goals. You can also define whether you will be running an “always on” strategy or a specific marketing campaign. An Always On campaign allows for platforms such as Google Adwords to learn the behaviours of your target audience and, by gleaning data, to become more effective over time. A campaign-based approach will consider a particular time-based promotion and gear towards achieving those objectives, whether it be visits or sales. Whether Always On or Campaign, the budget needs to stay in-line with the measurable KPIs you have set. One of the biggest reasons to set a realistic marketing budget is so you can avoid surprises. This means you need to be transparent with your co-workers and bosses. In this way, you can establish clear communication within your team so you can effectively measure your spending and establish a realistic yet affordable marketing budget. Once the marketing budget is set in place, you will also need to have spending caps for all your ads in place to prevent overspending. Considering your marketing KPIs and overall objectives that have been identified, how much will it cost to achieve your monthly or quarterly objectives? When starting out, there is no data on which to base your decisions, so often it is about the affordability. Once you have run your marketing programme for a month, you can start to identify what volume of Impression or Clicks your budget bought you. With that information, you can start plotting out what percentage growth could be derived from an increase in budget. Working with the right service provider, you may be able to optimise your campaign effectively enough to wring every drop of value out of your marketing spend, but as a small business owner who may not necessarily have a background in marketing, you may be running your Facebook and AdWords campaigns yourself, so you will no doubt be doing a lot of upskilling in the process. You should also consider what channels your target market prefer, are they on Facebook or do they prefer Twitter? At first-stab is may be worth doing a bit of legwork and internet stalking to answer this question, but once your campaigns are running the figures should be indicative. HubSpot has a great set of marketing budget templates for all your budget allocation needs. A template will help you more easily allocate spend accordingly, with your KPIs and marketing objectives in mind. Remember to always check your budget constantly to be certain you are not going over budget. This can be tracked and monitored in a simple Excel worksheet that tracks the overall budget and KPIs in relation to the number of days left in the month and how much money there is left. Is your budget able to meet your KPIs? If not, it could be that you need to work on stretching your money further by rethinking your targeting, or it could be that your KPIs are simply unrealistic, in which case you should look into resetting your SMART goals. Who are the winners and who are the losers? Some ad units or channels could be outperforming others, it may be worth re-allocating your resources to what’s working you’re your business. You may want to increase spending with a certain campaign or programme, or channel. Make sure you are not overspending on your daily and monthly limits, and make sure you are getting the best bang-for-your-buck by optimising your targeting and bid strategies across the different advertising platforms. You need to have all your bases covered, especially when it comes to your marketing budget, by keeping track of your actual spending. In the first few months, you should be benchmarking your pre-determined KPIs. Your set KPIs could be engagement, clicks, impressions, conversions or leads generated by social media channels, digital platforms, paid advertising and more. You may even define these KPIs on a campaign or project level. From there, you can attribute KPI successes and failures to allocated spend within your budget. As a result, inside of your budget spreadsheet, you must input your actual spend and the results of ongoing allocated spending per platform, campaign or project. So, for instance, if social media channels are generating positive results, you would be keeping a record of the results within your marketing budget spreadsheet. By doing all of the above, you will be able to see whether you are receiving a positive or negative ROI (return-on-investment) in the long-run. When it comes to your costs, you want them to be fairly flexible within your marketing budget. However, this flexibility can only be to a certain degree. Once the marketing budget is set you will have spending caps in place to prevent overspending. As a result, allocated amounts from your budget will be given to specific campaigns. Your budget needs to be spent strategically and you can even allocate an amount as part of a contingency for overspending. It is through thoughtful allocation that your marketing budget can be flexible and managed effectively in the long term. Efficiently and effectively managing your marketing budget is a case of preparations and keeping track of your progress overall. However, you need to be realistic not only with the total budget you set, but also the KPIs and goals which you wish to achieve. By doing so, you set yourself up for success more than failure.